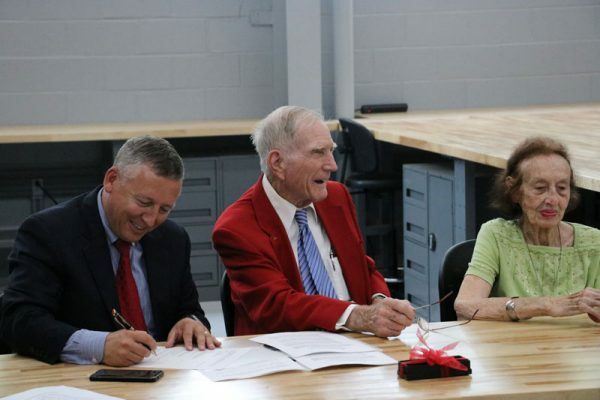 Dr. Charlie Suggs spent his 90th birthday like he had during many other days of his life: making a lasting impact to the Department of Biological and Agricultural Engineering (BAE). With the signing of the Charles W. Suggs Distinguished Professorship in Biological and Agricultural Engineering Endowment, Dr. Suggs and his wife Jane created the first named professorship in the department’s history. The Suggs’ children joined College of Agriculture and Life Science (CALS) Dean Richard Linton, Department Head Garey Fox, and BAE faculty, staff and alumni for the endowment signing. But Charlie can be known to make history: He was BAE’s first ever Ph.D. student in 1959. After several years in industry, he returned to his undergraduate institution for graduate school and served as a professor until retirement in 1993 as Professor Emeritus after 40 years on the faculty. Before officially signing the endowment, Fox presented the Suggs with a token of BAE’s appreciation. The Suggs Laboratory for Precision Agriculture and Machine Systems was unveiled to honor his contributions to the university, department and the discipline. The day culminated in a 90th birthday celebration for Dr. Suggs complete with his request: strawberry cake. Former students and colleagues took time to share stories about their time with Dr. Suggs and give insight into the man who inspired them.